Jenn and Romy: Nicole Visits / Our FIRST X-mas Tree! On Sunday, Nicole and Marcel came to stay with us again before they left to Europe (yesterday). 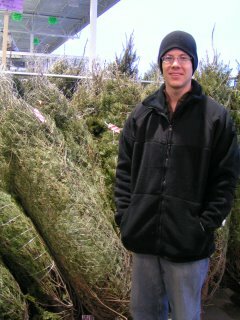 A few hours before they came, we went to Menard's to pick our first Xmas tree. It is a real tree. We brought it home on the roof of the car, and then brought it inside, stuck it in the red base, and then cut away the plactic netting that wrapped the tree. The smell instantly infused the whole apartment. Mmmmmm nice pine tree scent. 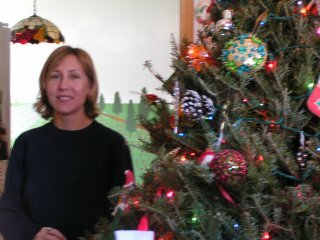 A few hours later, the branches began to go down, and the tree fluffed up (with some of Romy's help too). So the next morning, Nicole, Romy, and I all went to Romy's house to go get their old Xmas ornaments. They are all from the 40's and beyond. They were Romy's grandma's. 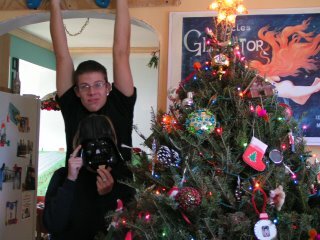 Darth Vadar makes an appearance; Romy hangs from the warrior training board. Nice tree. I love having real trees for christmas. I couldn't imagine having a fake one.